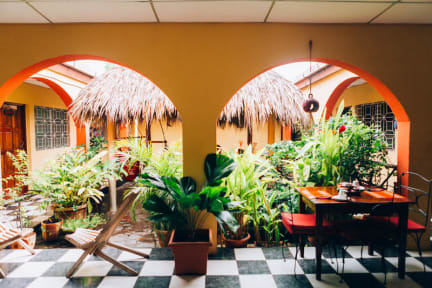 La Siesta is a cozy and familiar hostal open since 2005 by Boris and Marcela who give a French-Nicaraguan touch to the place. The 7 rooms are all around a flowered and quiet courtyard. We serve delicious breakfast in option (4 choices), including the authentic crêpes, homemade bread and fresh tropical juices! Delicious coffee is for free in the morning, since early morning!!! We are located in one of the most privileged areas of the city. 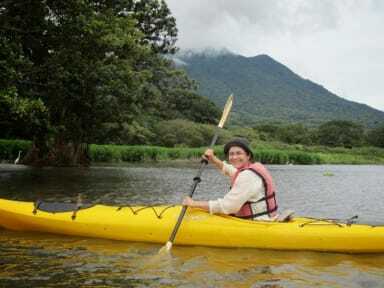 In this sense from our facilities you can reach some of the best spots and landmarks of the city such as ChocoMuseo Granada Nicaragua, Parque Central, Mombacho Cigar, supermarkets. We are oriented to offer privater accommodation for people who are looking fon tranquillity and relax. In this sense, we offer private accommodation for two people perfect for couples or friends travelling together. In addition, the atmosphere is really chilly, easy to meet guests from all continents and exchange tips, share a meal in the open kitchen, play board games, read a book from the nice personal library. We can help you to organize all your activities in Granada and surround either in English, Spanish or French. We like people, especially with good vibes, be welcome! Breakfast not included - 3.30 USD per person per day. The reception is open 24 hours per day. Nevertheless if you arrive between 23.00 and 06.00, please let us know in advance.